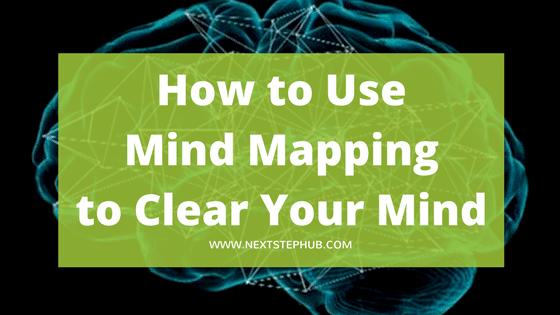 Do you want to know how to use mind mapping to clear your brain? Are you finding it hard to focus? Is it difficult for you to keep track of your brilliant ideas? If your answer is yes, mind mapping can be the solution to your struggles. 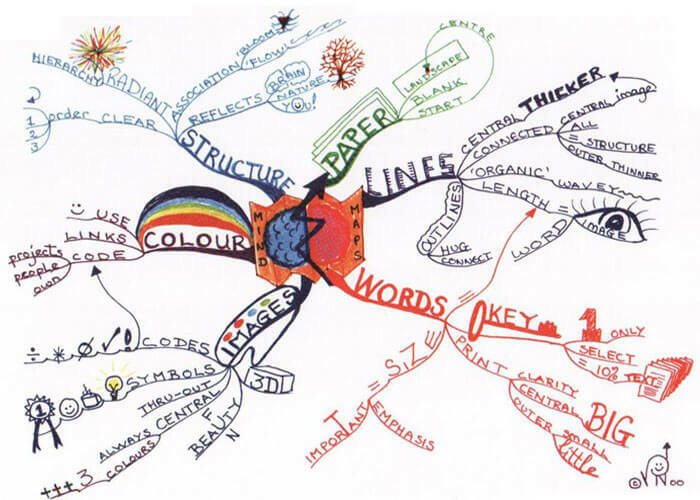 Mind mapping is a powerful graphic technique that is widely used by students and professionals. It’s a creative and logical way of taking notes by “mapping” your ideas. It’s both analytical and artistic, which is more engaging for your brain. Here’s an example of a mind map. Mind mapping, as opposed to the traditional linear note taking we’re used to, uses graphical representations of concepts and ideas. It’s a diagram that connects information to a central subject. It offers the creator freedom to sort out his thoughts through words, images, numbers, and even color. This way it becomes memorable and enjoyable to read. How can a mind map help an entrepreneur like me? When you’re an entrepreneur, your mind is almost restless. You always formulate new ideas and solve problems while keeping up with your everyday tasks. When you have so many things going in your head, it clouds your mind and makes you think in a dull, linear way. Your entrepreneurial juices will stop flowing. Here are the reasons why mind mapping is helpful for entrepreneurs. It generates and organizes ideas. Mind mapping can help you analyze the relationship among different information. You’ll also determine which ideas are relevant and which are not. It boosts creativity. 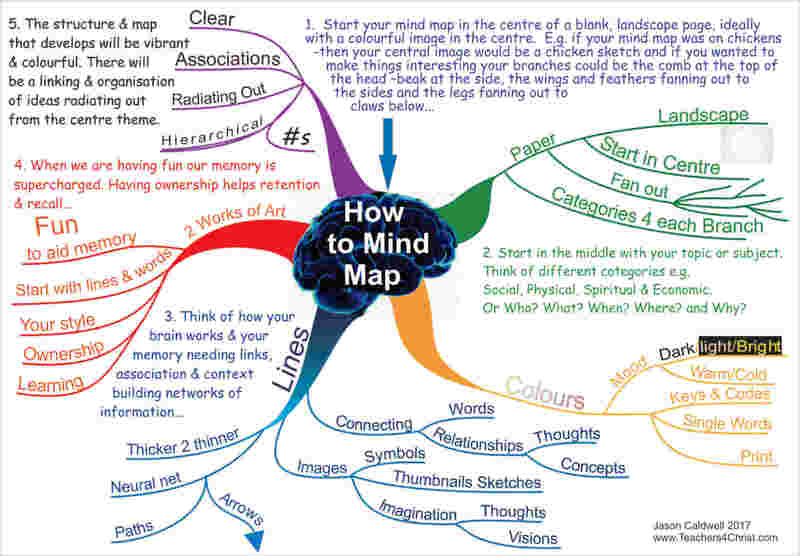 The structure of the mind map allows you to add more information, which combats creativity block. This is handy especially during brainstorming sessions. It enhances memory and retention. Colors, images, and keywords are easier to remember than long sentences. It’s a good tool for communication. Mind maps can be used to represent your ideas or projects to your team. It’s also great in explaining complex ideas and collaboration. Your teammates can write down their own ideas on the map. Write down your main idea at the center of the blank page. Starting in the center gives your brain freedom to spread out in all directions. Define your sub-ideas and draw branches to them from the center. Use keywords and short phrases to make your map more flexible. Use images. They can get the message across without having to use many words. Be creative! The best thing about a mind map is you don’t have to follow any strict rules. You can add stickers, sketch images, even emojis. Don’t worry about doing it right, just have fun. A pen and paper are enough to get you started, but there are software and tools that can make mind mapping more fun. MindNode – MindNode makes mind mapping delightful. Even if you’re not familiar with the concept of mind mapping, you can still use it because the interface will teach you how. This tool has colorful photos and stylish stickers. You can also add links and share interactive documents. Lucidchart – This web-based tool lets you sketch-and-share professional flowchart diagrams. It’s best to use during meetings and brainstorming sessions. Mindjet – Mindjet has flexible mind maps and diagrams that enable quick organization of ideas and information. It’s a management and collaboration tool as well. You can integrate this software with any other web-based services. XMind – XMind is another popular mind mapping tool. It has amazing features for entrepreneurs like business charts, milestone tracker, and org chart. Its powerful presentation mode lets you view and present your ideas. You can even save your map as an Evernote note and share it with others. Coggle – Coggle is great for collaboration. If you’re building a mind map with your team, this is the perfect option for you. This tool lets you make comments, chat, and view revision history. Bloomfire – This works best for a large creative team. You can make multiple maps here and track the content that comes from those ideas, and how successful it is compared to other content. IdeaFlip – This software uses Post-it-like shapes that you can place and connect in different ways and styles. The interface is simple and easy to use. MindMeister – MindMeister has a cool feature called Opinions. Collaborators can vote “yay” or “nay” to nodes in your shared mind map. SimpleMind – If you’re looking for a mobile-friendly mind mapping tool, this is for you. It’s incredibly easy to use. Just pick a template, make a node, and type your ideas. iThoughts – Another mobile-friendly tool, especially for iOS users. You can export your maps to PowerPoint, Word, Excel, and PDF readers. When you use mind mapping daily you’ll feel more productive and fulfilled. Give it a try. Follow our tips, use our recommended tools, and see the results for yourself. Hi Fariha, we are glad you found it helpful ! Thanks for your feedbacks ! Let us know how you like the other method too !